Dianthus deltoides is a spectacular first-year-flowering perennial that forms a dense evergreen mat around 10cm (4in) tall. The real joy of this plant comes from late spring when a seemingly impossibly large number of flowers are borne in quick succession giving several months of both colour and clove-like scent. Whilst at times sporadic, flowering can carry on until mid September and beyond. 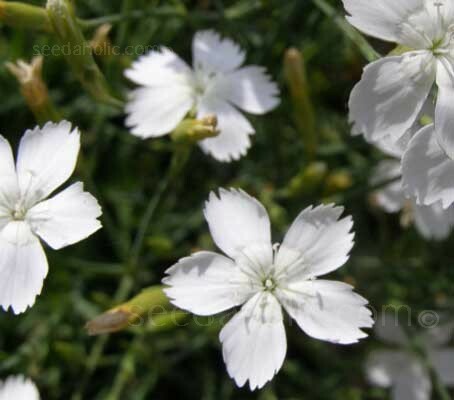 Dianthus deltoides ‘Confetti White’ feature snow white blooms. The flowers appear in abundance, just poking their heads above the deep green foliage. In the early morning dew or after a shower of rain they sparkle like clear white diamonds. 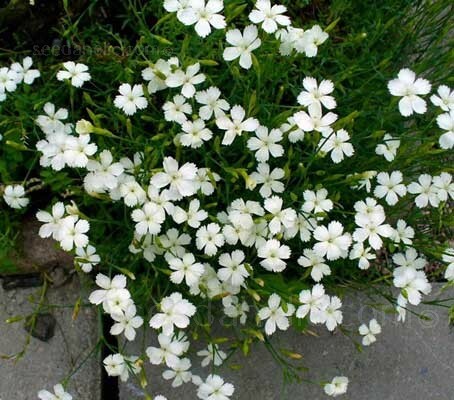 This quite exceptional little plant will and grow up to 50cm (20in) wide, it covers bare spots quickly. Heat tolerant and hardy to minus 35°C (30°F), they are at their best in full sun but will also grow in part shade. The plants will tolerate a wide range of soils provided they are well drained. Dianthus deltoides look at home at the front of the border or tucked amongst boulders in a rock garden. They can be grown in large groups for underplanting or used as a ground cover in gravel gardens or to edge a path or walkway. Use them for sloping areas or plant in crevices or on top of walls. They also make an attractive addition to container gardens. Cottage/Informal/Natural Garden, Borders and Beds, Dry Gardens and Rockeries. Edible Flowers. The flowers of Dianthus deltoides, Maiden Pinks are edible, most have a pleasant spicy, floral, clove-like taste and are ideal for decorating or adding to cakes. They make a colourful garnish to soups, salads and the punch bowl. It is advisable to remove the white heel at the base of the petal as this has a bitter taste. The petals add zest to ice cream, sorbets, salads, fruit salad and dessert sauces and give beautiful results when crystallised or if used as an edible garnish. The colours are vivid and the effect is transforming. Suddenly a plain salad looks like a show-stopper. Dianthus deltoides is a species of Dianthus native to most of Europe and western Asia. It is a plant of often calcareous grassland but may also be found on rocky ground and occasionally on old mine spoil. The species name deltoides means ‘roughly triangular shape’ and refers to the shape of the petals. The word is taken from the Greek words delta meaning ‘triangular’ and oides , meaning ‘resembling’. An easy way to remember this description is by remembering the shape of the Greek letter ‘Delta’ - Δ is triangular, or that the ‘deltoid’ muscle - is the triangular muscle on the human shoulder. Dianthus deltoides are often commonly called Maiden Pinks because each stem carries only one flower. Many Dianthus are called 'pinks.' 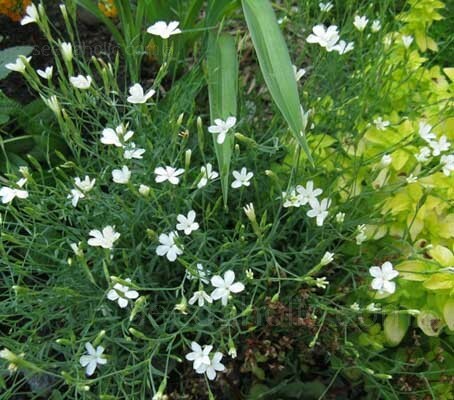 Not due to their colour which can also be white, but to the distinct cut edge that the flowers have. The verb 'pink' dates from the 14th century and means 'to decorate with a perforated or punched pattern' (maybe from German 'picken' = to peck), coming from the frilled edge of the flowers. This verb sense is also used in the name of pinking shears. D. barbatus, known as Sweet William, this is a biennial plant that sometimes behaves as a short lived perennial. At 45 to 60cm (18 to 24in) tall, it blooms in a wide range of fragrant coloured blossoms and as such has been a garden favorite for over 300 years. D. chinensis varieties are often sold in garden centers as perennials although many are not reliably hardy in cold areas. They can be treated as hardy annuals unless you live in a warm zone.